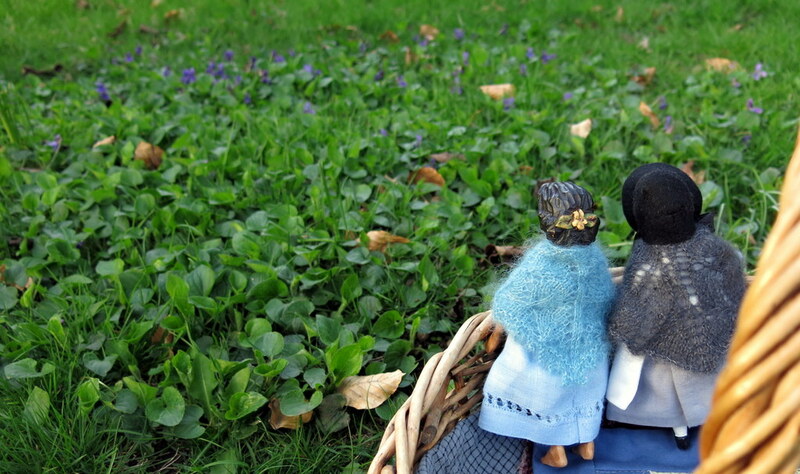 Viola and Mary Ann came to a far away garden with me to see if the violets were out yet. This is Viola’s favourite flower because of her name, and because of the yellow violet carved into her hair. Viola collected a few stems to bring inside – the tiny blossoms are so pretty, sweet, and delicate, and their fragrance is surprisingly strong, and delicious! The Simnel Cake is decorated with candied violet petals! Oh how lovely! I always look forward to the first violets but we do not have as many as they discovered. The Simnel cake is beautiful and looks delicious! The cake was delicious! My Grandmother always talked about yellow violets…I don’t think we have them here. 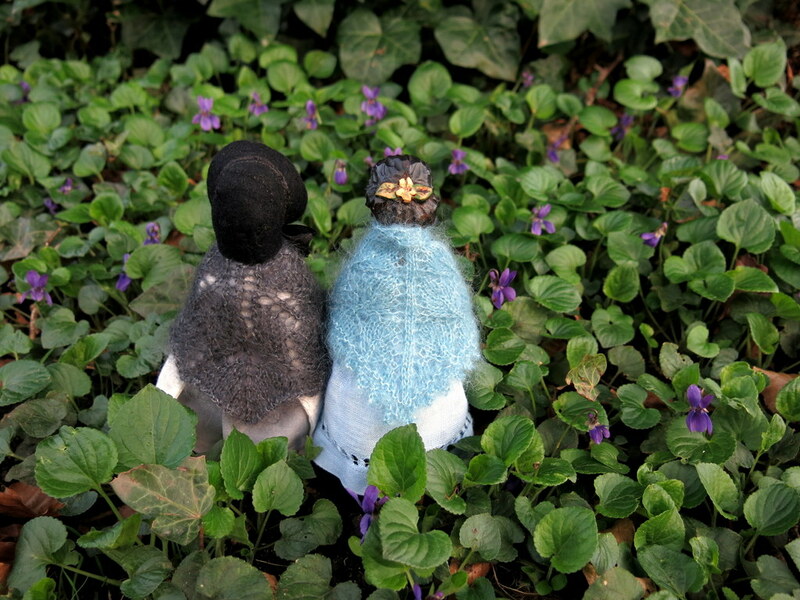 I am glad our purple ones are out at last, and I wish I could send you a sniff! All is stunningly peaceful and pretty….violets have always been my favorite flower since early childhood. 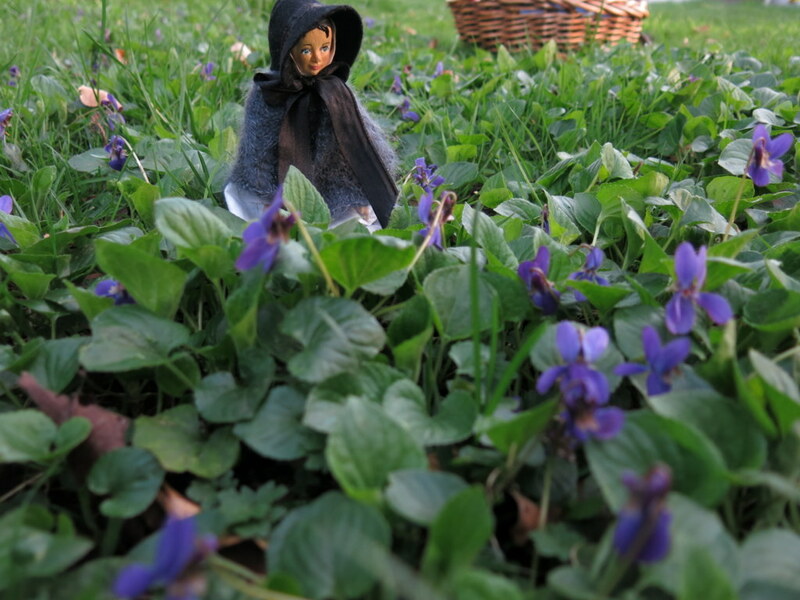 It’s so wonderful to see your photos especially with the lovely dolls wandering amongst the bower. 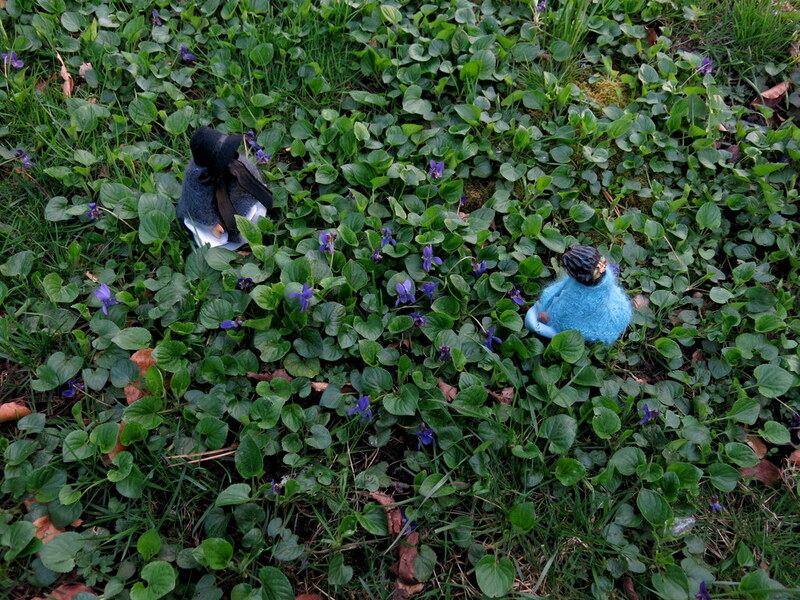 The dolls are both so glad they could come with me on this violet-filled evening, it was peaceful and pretty, and they are both very fond of these flowers. I am so grateful to you for sharing all of your beautiful photos. I enjoy them so much…you brighten up many a day. 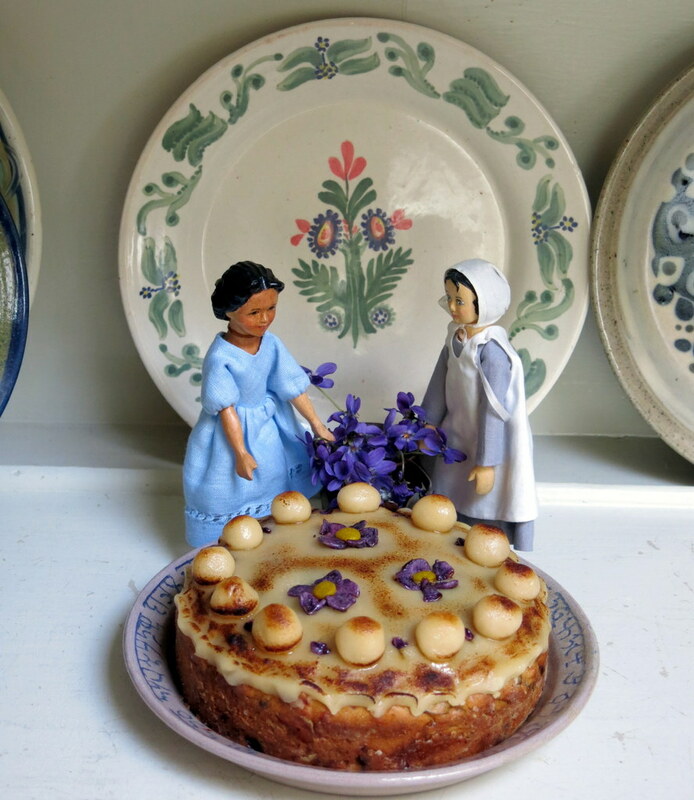 The violets that Viola and Mary Anne found are lovely and the Simnel cake is the first one I have ever seen. Looks so pretty. I am always surprised at how strong and pretty the fragrance is when we bring the flowers inside! Viola and Mary Ann had a little nibble of the cake and report that it was very tasty! The Simnel cake looks scrumptious. I had to look it up and read the recipes…oh so tasty!! Love seeing the girls in the violets. Ours are not blooming yet. Thanks for sharing yours. 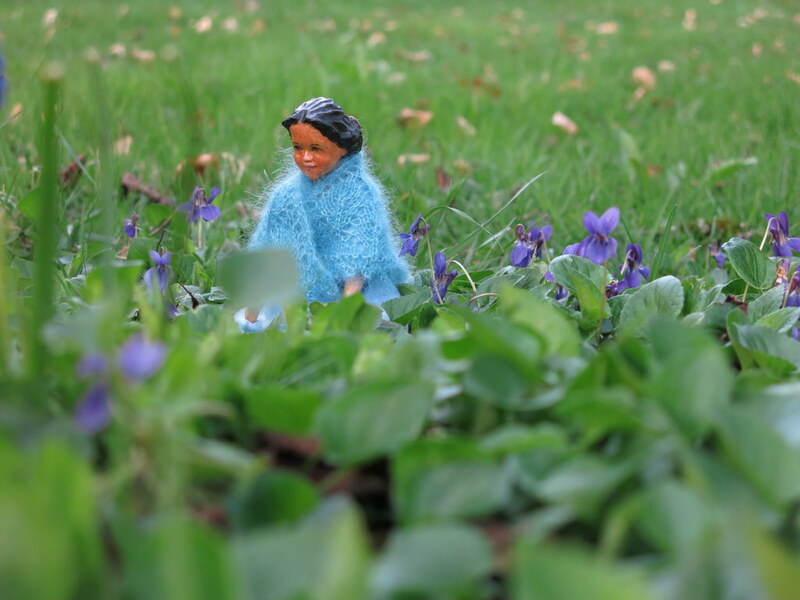 We hope your violets will bloom soon, meanwhile I am happy to share ours…they are a surprisingly uplifting little flower, despite being so small and low to the ground. I wish I could send you a slice of Simnel cake!